The following is general information that applies to all patients having surgery at OrthoNebraska Hospital at 144th and Center. More specific information may be given to you by your doctor or nurse, especially if you are having surgery at a different location. 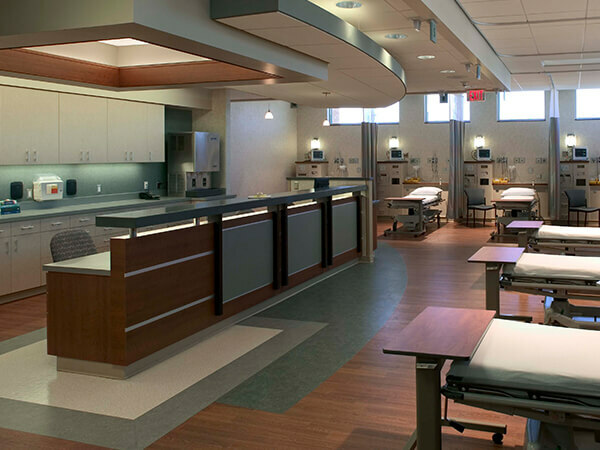 At OrthoNebraska, we try to make preparing for surgery easy. 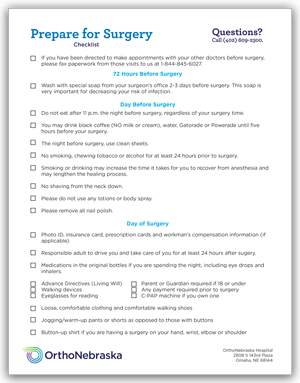 Print this checklist for more help getting organized before your surgery. If you meet any of the below criteria and are undergoing anesthesia, you need to schedule an appointment with your primary care physician 15-30 days prior to surgery. It is important to have your history and physical completed more than two weeks prior to your surgery date to avoid delay or cancellation. If you have seen a cardiologist or have a history of heart attack, stroke, stents or other heart surgery, you must be seen within six months of your surgery for surgical clearance. If you have a history of COPD, pulmonary hypertension, sleep apnea but do not use a machine/mouthpiece or use oxygen at home, you must be seen by your pulmonologist within six months for surgical clearance. These specialists need to examine you with the surgery in mind to make sure it’s safe for you to have surgery. All paperwork from your other providers (primary care or specialists) for surgery clearance should be faxed to the hospital at 1-844-845-6027. Your doctor will have specific instructions regarding aspirin and NSAID (Motrin, Ibuprofen, Aleve) use prior to surgery based on your exact surgery. Instructions about discontinuing these medications will be discussed during the pre-screening phone call. If you have questions, before a nurse calls you, call 402-609-2300. Tylenol (Acetaminophen) is ok to use prior to surgery. Stop all herbal medications seven days before surgery. Blood thinners such as Coumadin (warfarin), Xarelto or Plavix require careful consideration by your cardiologist or primary doctor who prescribed them. Do NOT stop blood thinners without checking first. It is important to have this discussion as soon as surgery is scheduled, as sometimes medications are stopped seven days before surgery. Please make arrangements for someone to drive you home and stay with you for the first 24 hours following your surgery. The person that drives you home and stays with you overnight must be at least 19 years of age. Primary Care Physician: name and phone number of your family doctor and any specialists to contact for screening or testing results. Past Medical and Surgical History: what surgeries you have had done and the approximate years, your past and ongoing medical issues, any anesthesia problems for you or your family, and pacemakers or any other internal devices, including their cards. Current Medications: a list of all medications you take, including dose and frequency. This includes all prescription creams, nasal sprays and eye drops. Please also bring your medications to the hospital if you are planning on spending the night. The hospital will use your own home medications as a cost-saving measure to you. Allergies/Sensitivities: the names of any medications you have had allergic reactions or sensitivities to and the type of sleepwear. Please notify the nurses if you have any symptoms of infections, such as a fever, open sores, wounds, rashes, urinary tract, or dental pain. It may increase your risk of a post-operative infection and could cause your surgery to be cancelled. Do not have a pedicure or manicure a week before the surgery. It also increases the risk of infections. We prefer you avoid having a manicure or pedicure within a week of surgery. However, if your nails are painted, gel polish or shellac, you may leave those on. 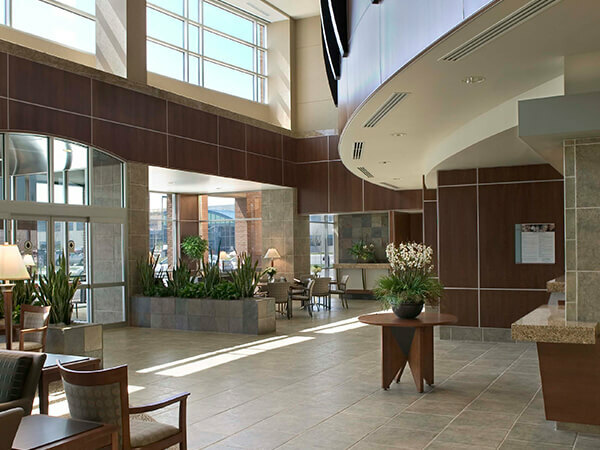 If you have any questions prior to your surgery, call (402) 609-2300. You should wash with special soap 2-3 days before surgery. You should obtain the soap from the surgeon’s office. This soap is very important for decreasing your risk of infection. Do not eat after 11 p.m. the night before surgery, regardless of your surgery time. You may drink black coffee (NO milk or cream), water, 7up, Gatorade or Powerade until five hours before your surgery. If you are diabetic, Gatorade G2 or Powerade Zero would be a better choice. Please do not smoke, chew tobacco or drink alcohol for at least 24 hours prior to surgery. Please do not use any lotions, deodorant or body spray. Check-in at the front desk before using the restroom in case a urine sample is needed. The pre-screening nurse will let you know which medications should be taken the morning of surgery. Medications, if you are spending the night, please bring the medications in the original bottles. This does include eye drops and inhalers. If you are going home the same day of surgery, if you use an inhaler, please bring that to the hospital. C-PAP machine if you own one. Please wear a button-up or zip-up shirt if you are having hand, wrist, elbow or shoulder surgery. We advise a shirt that is large on you.